Mangaluru, July 1, 2018: Hospitals in the city marked Doctors’ Day June 30, Saturday. K S Hegde Medical Academy observed the Doctors’ Day by honouring and felicitating five doctors - Dr B Jayaram Rai, anaesthesiologist from Nitte Gajria Hospital, Karkala; Dr H A Shenoy, a surgeon from Payyannur; Dr Bhaskar, an orthopaedic surgeon from Puttur City Hospital, Puttur; Dr Arun Prabhu a physician and Dr Asha Prabhu, an anesthesiologist from Sirsi. Dr Satheesh Kumar Bhandary, vice chancellor of Nitte Deemed to be University, said doctors perform various roles in every day of their professional life, as a leader, as a continuous learner, as an effective communicator and has to manage his patients and fellow colleagues with utmost ethics and best professional behaviour. At Kanachur Hospital and Research Centre, the day was observed to mark the importance of physicians and invaluable service to the society. On the occasion, Dr Udayshanker, HoD, Physiology, Kanachur Institute of Medical Sciences, stressed the fact that doctors need to be empathetic and should always help the needy. 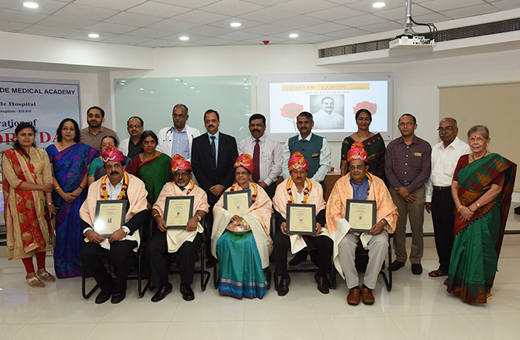 At A J Hospital : Senior doctors were felicitated by A J Hospital and Research Centre and A J Institute of Medical Sciences. Dr Prabhakar Rao, senior physician and professor, A J Institute of Medical Sciences; Dr Ramesh Pai, senior physician, ex-Dean, A J Institute of Medical Sciences; Dr Latha Sharma, senior gynaecologist and ex-HoD, OBG, A J Institute of Medical Sciences; Dr Jayaram Shetty, general practitioner, serving in Bajpe for the past 40 years and Dr Kumaraswamy U, general practitioner, serving in Derebail-Konchady for the past 37 years, were felicitated.